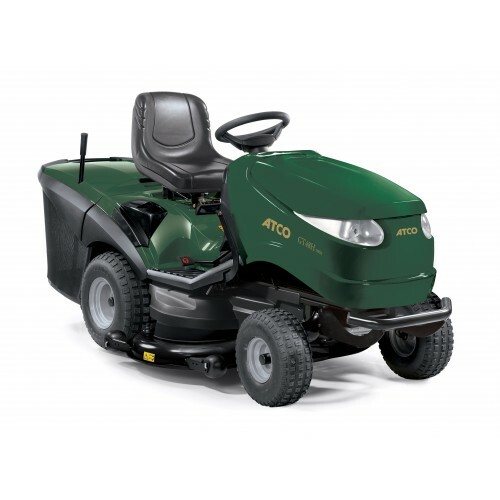 The GT 40H Twin 4WD is fitted with a 724cc Briggs & Stratton Intek Series 8240 (EFM) Twin cylinder engine. This tractor also features a twin blade "timed" cutter deck. The blades contra rotate and overlap each other; this provides an excellent finish even with such a wide cut. This arrangement also creates a very powerful collection system. Clippings are blown through the rear discharge outlet into a large 360 litre capacity collector which also features a buzzer to alert the driver when it is full. The 4WD transimission powers all 4 wheels at the same time meaning traction is not compromised when on slopes, undulations, long grass or rough terrain.